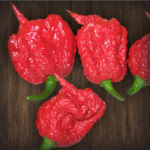 These are 1” conical hot peppers, excellent for pickling or drying. They also make beautiful ornamental plants that produce hundreds of golden yellow peppers. They start green, turn a very dark purple, and then are ripe when golden yellow. Suitable for containers. I’ve grown these the past couple years, and I really like these peppers. The plant is very prolific, providing many hot fruits.